For this week’s Trove Tuesday, I am sharing two articles about the death of my grandfather’s sister Mary Marr. I then found a more detailed article. 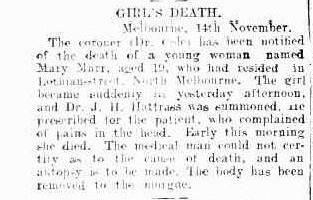 I wasn’t able to find an article about her death in either the Argus or Age (the two main newspapers for Melbourne), but I was able to find her death notice.